Chickpeas or garbanzo beans are an excellent source of plant-based protein which helps prevent diabetes and aid in weight loss. The amazing benefits of chickpeas include the ability to improve digestion, prevent heart diseases, stabilize blood pressure levels, and lower the risk of genetic diseases and cancer. They also boost bone, skin, and hair health. Chickpeas or garbanzo beans are a powerhouse of nutrients, packed with plant-based protein, dietary fiber, and carbohydrates. They are a rich source of antioxidants and minerals such as iron, zinc, magnesium, folate, and phosphorous. The nutty seeds also have a number of essential vitamins like thiamin, riboflavin, niacin, vitamin C, A, B6, B12, and vitamin K.
Chickpeas have a high amount of soluble fiber which helps regulate blood sugar levels by optimizing digestion. They can prevent the development of diabetes by ensuring normal levels of insulin and blood sugar and help people manage the condition. Garbanzo beans with their high density of nutrients, combined with the dietary fiber, are perfect for people trying to lose weight. The fiber helps the body feel full for longer, by interacting with ghrelin, the hunger hormone, and inhibiting its release to some degree. The blend of nutrients and minerals also keeps the body energized and active, preventing fatigue and snacking between-meal. This makes chickpeas great for reducing overall caloric intake, because you simply don’t feel hungry, despite the 270 calories per cup of chickpeas. The high levels of dietary fiber found in chickpeas can help to bulk up your stool. This keeps your bowel movements regular while eliminating inflammation, cramping, bloating, and constipation. This can also improve absorption of nutrient digestion and ensure that you’re making the most of the nutritional value of your food. Our cardiovascular health gets a boost in two different ways from garbanzo beans. First, the high levels of soluble fiber help to balance cholesterol levels and aid in preventing atherosclerosis, heart attacks, and strokes. Second, this legume can also reduce the amounts of LDL (bad) cholesterol in the blood. 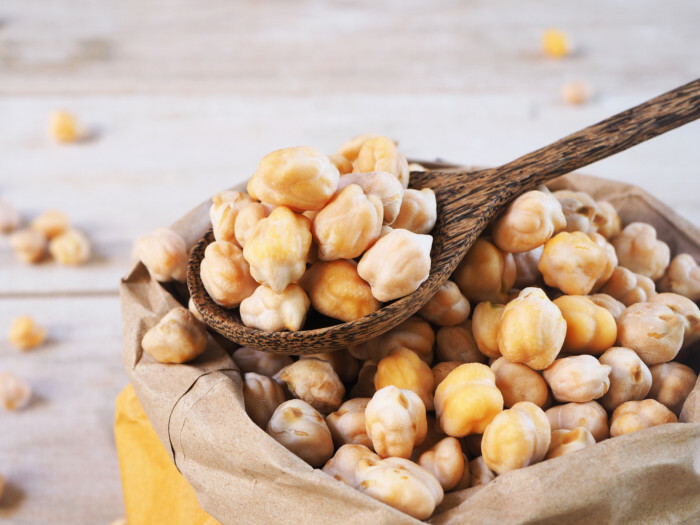 Furthermore, the only fats that are found in garbanzo beans are omega-3 fatty acids, which are the beneficial polyunsaturated fats that help protect the heart and reduce inflammation throughout the body. Chickpeas are an important source of the proteins needed for growth and development, as well as proper healing and repair throughout the body. They are an ideal option for vegetarians who want to ensure they have the proper nutrient intake. However, one should not rely on chickpeas as a sole source of proteins. A balanced protein intake is advised. The antioxidant compounds found in chickpeas include polyphenols, phytonutrients, beta-carotene, and key vitamins. These reduce oxidative stress in the body and prevent chronic diseases. Antioxidants seek out free radicals, the dangerous byproducts of cellular metabolism, which can cause healthy cells to mutate. These antioxidants can help protect the body from cancer, coronary heart diseases, macular degeneration, and even cognitive disorders such as Alzheimer’s and Parkinson’s disease. Garbanzo beans being rich in iron, phosphorus, magnesium, copper, and zinc are exceptionally good for bone health. Many of those minerals are essential to improve bone mineral density and prevent age-related conditions like osteoporosis. Folate is an important B-vitamin for many different reasons, especially for women. Low folate levels are closely associated with neural tube defects and other complications with the birth of children. Adding folate-rich chickpeas in the diet during pregnancy is a delicious way to ensure baby’s healthy delivery. Choline in chickpeas is a macronutrient that plays a vital role in the body’s ability to fight chronic inflammation. It also regulates your sleep cycle, increases the range of movement in the muscles, as well as boosts learning and memory. Consuming garbanzo beans can be a safe and natural way to counter menopausal and postmenopausal symptoms like night sweats, mood swings, and hot flashes. Chickpeas contain plant hormones known as phytoestrogens, which mimic the body’s natural female hormone estrogen. They also guard against diseases that commonly affect women such as breast cancer and osteoporosis.